GOLD PRICES jumped to new 7-week highs at $1291 per ounce on Tuesday, again testing the 6-year downtrend line in place since the metal's 2011 record highs as Western stock markets fell with longer-term interest rates. After the ISM Prices Paid measure of inflation in manufacturing costs "tanked" in Friday's report for May, 10-year US Treasury yields today fell again to post-Trump election lows of 2.15%. Crude oil also extended its drop despite the "freezing out" of Qatar by other Gulf states over what Saudi Arabia and now US President Trump call the "funding of radical ideology." British police meantime said they and the MI5 security service had one of Saturday night's 3 suicide-murderers in London Bridge under close surveillance back in 2015, when he appeared on a national TV documentary entitled The Jihadi Next Door. "Gold is not just for turbulent times, it has been a good source of returns over the last 10, 20 and 30 years," said former UBS and then Paulson & Co. strategist John Reade, now chief market strategist for the mining-backed World Gold Council, at the Asia Pacific Precious Metals Conference in Singapore. With 2 days left until the UK's snap General Election – now forecast to leave the ruling Conservative Party well short of the "landslide victory" previously expected – the British Pound rallied but held 2 cents beneath mid-May's push to 8-month highs near $1.3050. That helped the gold price for UK investors rise back above £1000 per ounce – a 3-year high when smashed by gold's surge on last June's Brexit referendum result – for the first time since late April. For Dollar traders, "Resistance comes in at $1295.70 – the April high," reckons the latest technical analysis from bullion bank Scotia Mocatta's New York office. 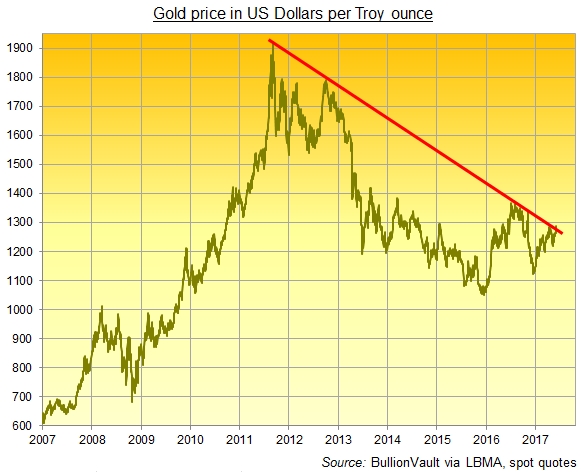 Having hit that level 7 weeks ago, "Gold approaching a multi-year ceiling [now at] $1291...should be a test of character," says technical analysis from French investment bank Societe Generale, pointing again to what it calls "pivotal trend line resistance in place since the 2011 peak. "A break past $1291/95 [on gold's weekly close] would indeed be a game-changer." Despite gold's sharp price rise however, investor interest in the giant SPDR Gold Trust (NYSEArca:GLD) has barely changed during the $70 gains of the last 4 weeks, keeping the quantity of bullion needed to back the GLD's shares in issue at 851 tonnes. The giant iShares Silver Trust (NYSEArca:SLV) has meantime shrunk by 1.2% in size since silver prices broke back above $17 per ounce in late May. Silver today rose to 6-week highs above $17.70 per ounce, gaining almost 10% since 9 May. Noting the gold ETF holdings "increased modestly on Friday" to reclaim month ago levels, "We are seeing continued interest in the yellow metal from money managers," says the trading desk at Swiss refiners and finance group MKS. 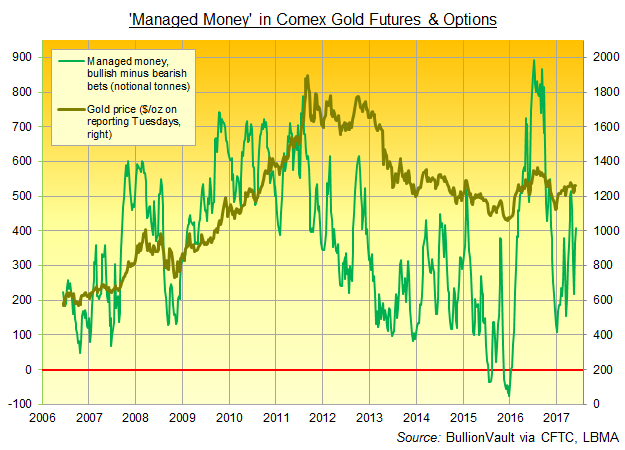 The number of bullish minus bearish bets in Comex gold futures and options held by the 'Managed Money' category last week grew 12%, according to data from US regulators the CFTC, posting its second consecutive week of gains. That took the Net Spec Long above its 10-year average for only the 6th time in 22 weeks of 2017 to date. Tuesday saw gold priced in Yuan shoot to its highest since late April above ¥282 per gram even as the Chinese currency surged to a 7-month high against the Dollar amid what analysts called "liquidity tightening" by the Beijing authorities, plus the introduction of a new pricing model for the Yuan's benchmark FX rate. Together that cut the premium offered to Shanghai gold imports from the world's trading hub of London to $7.55 per ounce, the weakest incentive in more than a month. The Euro in contrast slipped half-a-cent from last week's new 6-month highs versus the Dollar, helping the gold price for single-currency investors touch € 1150 for the first time since start-May.